and that picture is of the only part that's done. Actually, these are this year's summer dresses for the girls. The plan was to make them two each. I've made one, just to test the draft. Kate wore it until it shrank (or she grew) to the point that it now barely covers her bottom. This is such an easy summer dress that I am going to do a tutorial for it here, hopefully before winter comes. So much easier and less iffy than shirred sundresses. And yes, all knit fabric. My children refuse to wear wovens, remember? See that neckline? All the edges are bound like that - with the actual fabric itself, but we can use the natural sideways stretch of the knit to hug curves without having to cut bias strips like with wovens. So easy you wouldn't believe it. The men sewed a hot air balloon. A life-saving hot air balloon, for heaven's sake!!!!!! They didn't just buy it from Target. They sewed it!!!!!!!!! The men used one of their sons' Physics textbook to make the burner. The men went fabric shopping. The fabric store staff were exactly the same in the 1970s as they are right now - they ask you what you are making, and then look critical when you tell them. And they are disapproving when you buy in bulk. The men lied about what they were making, incidentally. I was probably channeling them without realizing it when I wrote my guide to surviving fabric-shopping with small children. After the movie, I looked at my cutting board and bits of shredded fabric on the floor and became all existential and profound. 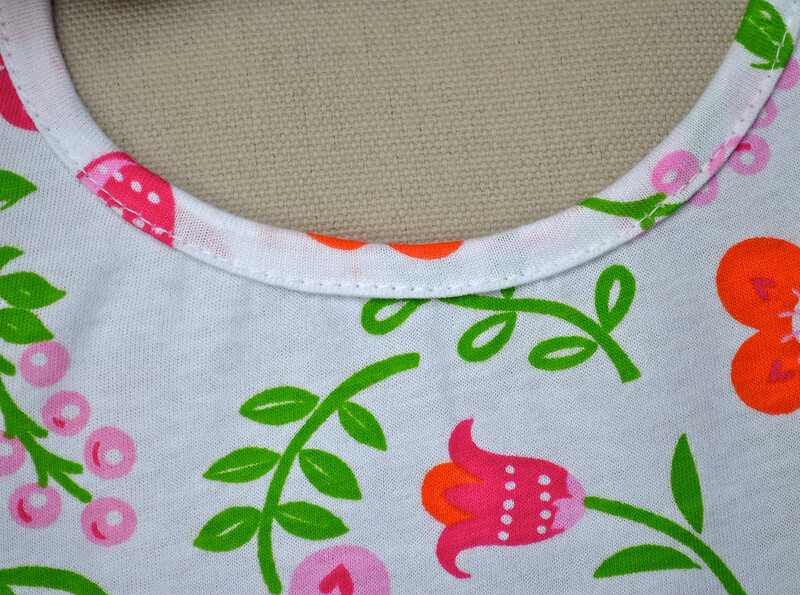 Why am I sewing summer dresses? How are they life-saving? Who will make a tear-jerker Disney movie of my sewing pursuits? Why aren't I using my old Physics textbooks (for purposes other than weightlifting and flower presses, I mean)? Why have I just spent a year of my life cloning myself? What will I do when the world's supply of hazelnuts runs out and nutella becomes a black market item? Why have I no ambition to change history, one designer fat quarter at a time? Maybe your tutorials are providing someone else with the skills they need to rescue themselves, escape poverty, provide for their family. Maybe you are changing history and you don't even know about it! Oh and there I was thinking that you were changing history - mine at least! Because you're not a man! Thanks for this post, I enjoyed it! Your timing is perfect Lier. Our shops are full of summer clothes already, have been for months and we're in our last month of winter, although it's not cold. I looked at some of the summer fashions for my soon to be 7 year old daughter and was flabberghasted. Everything's black, grey, covered in graffiti and glitter and very provocative. Time to get the sewing machine out and sew some pretty little dresses and skirts that are appropriate for a 7 year old girl. I'll look forward to it. As I read it, you are being the very best LiEr you can be -- and that is all that matters! History is in the eye of the writer. You simply ARE. It's so awesome to have your crafty posts. They definitely make the world better. Also, I saw this and immediately thought of you. I really want to learn how to do that kind of binding! Someday, somewhere, your tutorial on zippered welt pockets will be lifesaving. Or at least sanity saving !? Sometimes, life doesn't need to be changed - it only needs to be embellished. I see the love that you pour into your projects, and they reflect the love that you have for life and for your family. Small gestures can be as powerful as large, heroic feats - and your girls will know this one day. In the meantime, I look forward to your tutorial. I have nephews who, like your daughters, are happier with knits than with woven fabrics. Thanks! P.S. I'm eager to clone myself, too. Whenever you have time to deconstruct Fleur, I'm all ears & eyes! Night Crossing is a fantastic movie and I just had to laugh at your description of their experience in the fabric stories (in a closed, oppressive, Communist nation) and how similar it was to shopping in a fabric store today (in an open, free, non-Communist nation). Brilliance. Fleur Deconstructed Part 1 - plus a giveaway!